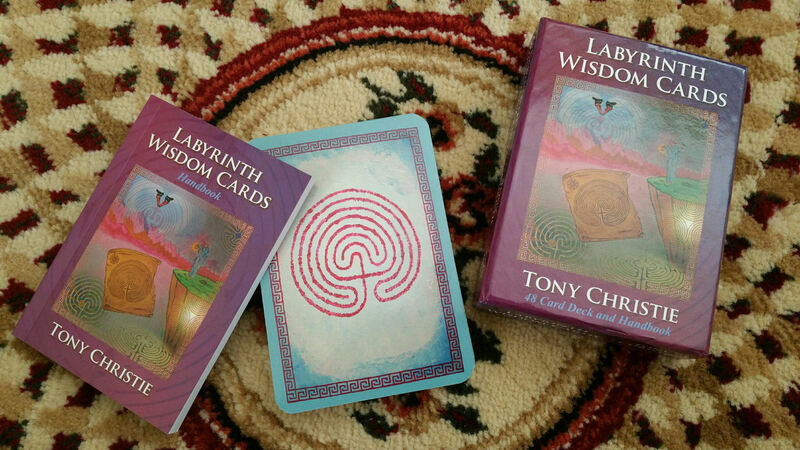 It was love at first sight, between me and the Labyrinth Wisdom Cards by Tony Christie. You can buy the deck here, and check out some videos of the deck creator here and here. Definitely watch the videos. Tony Christie is an author, inspirational speaker, artist, spiritual healer, and labyrinth designer. The labyrinth is an ancient symbol that is over 4000 years old, and what it is in a nutshell is a winding, circular path from a perimeter outer point to the center, or the heart of a matter. Use the labyrinth as a form of walking meditation. You ask a question before the walk, hold that issue in your mind, then walk the labyrinth and when you reach the center, the revelation will come to you. 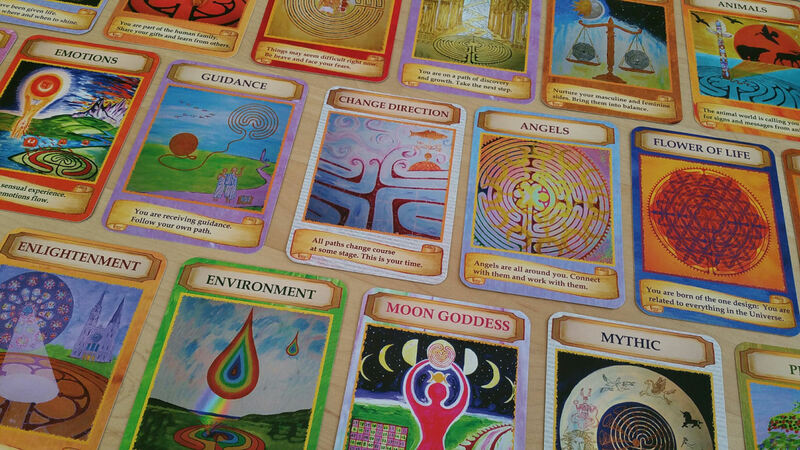 Likewise, the Labyrinth Wisdom Cards are intended to operate in the same way. 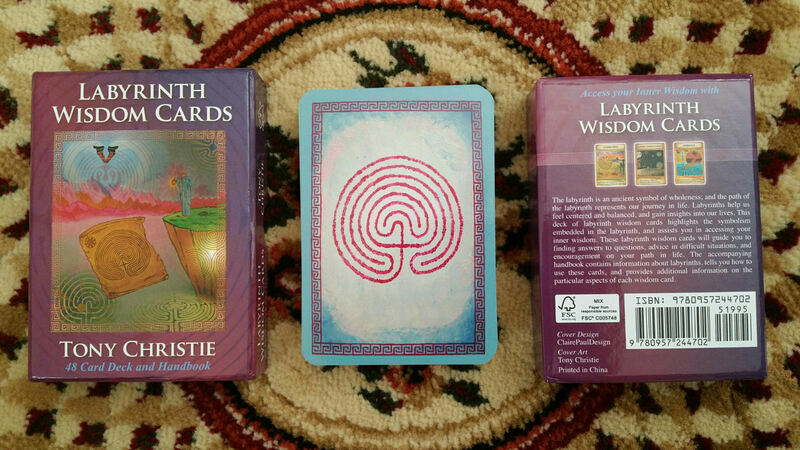 Hold an issue in your mind, then pick a Labyrinth Wisdom oracle card, and see what the labyrinth card has to say to you. Let’s give it a try. Think of a question or issue that you’d like an answer for. Hold that matter in your mind through the course of this post, before selecting a card, and then at the end of the post, you’ll select one of those three Labyrinth cards. The deck comes in a two-piece box that’s sturdy and high-gloss. It holds up well and according to the back of the box, the paper is made from responsible sources. Cool. The card back design is a calming blue with a classical labyrinth at the center. There’s an ornamental border that is reminiscent to me of Chinese art. 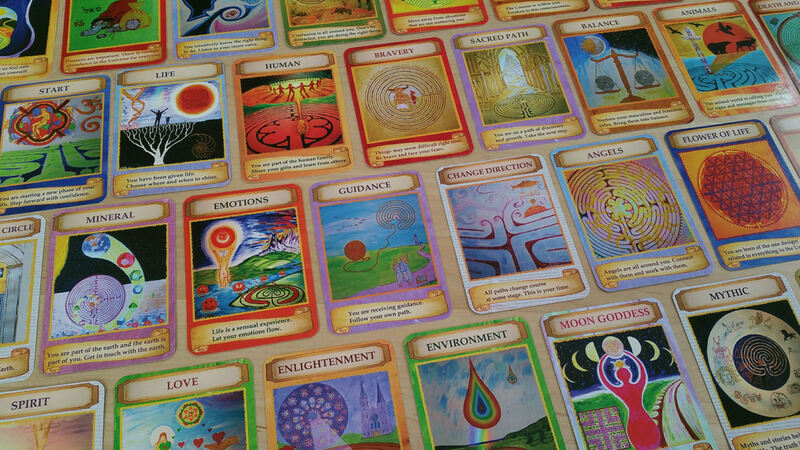 The oracle deck comes as a set of 48 cards. The card quality is a bit thin and flimsy, so do exercise some care when handling them. There’s a semi-gloss finish for protection, but the cards can still crease and wear with ease, so I wouldn’t advise rough shuffling or handling. I love how carefully thought out each card imagery is. Christie has put in an exhaustive amount of research and history into drawing these cards. “Bravery” is an Otfrid labyrinth from a 12th century Christian manuscript. “Confused” is based on Native American mythos, and the labyrinth featured is known as “The Man in the Maze” inspired by the mysticism of the Tohono O’odham and Pima tribes in Southern Arizona. 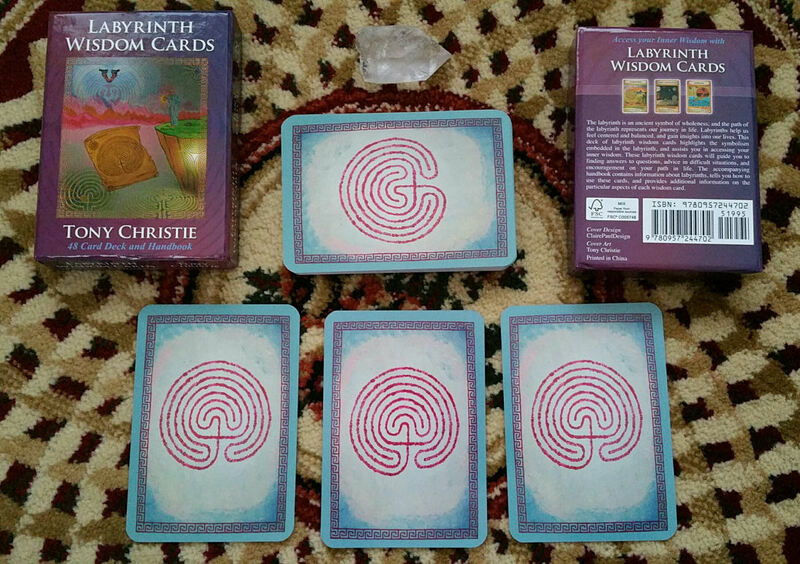 The card imagery in Labyrinth Wisdom is imbued with the symbolism, wisdom, and spirit that Christie sees in the labyrinth design. 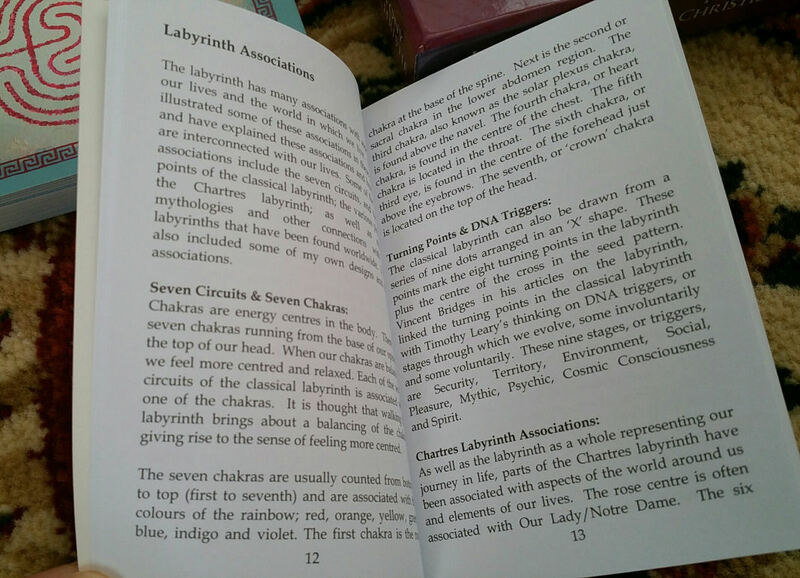 He calls upon classical labyrinths associated with our chakras as part of his inspiration for the oracle cards. 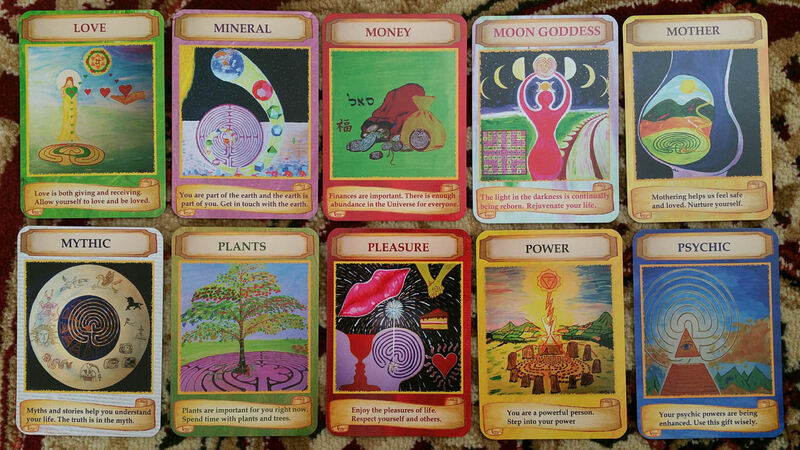 I love the imagery and more than the art on the deck, I love the oracular messages. 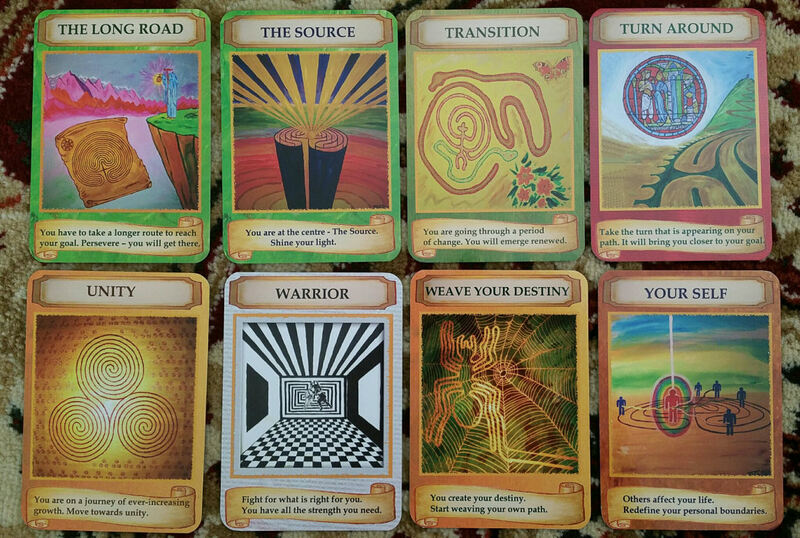 The messages on these cards are remarkably well tailored for providing guidance and insights for any aspect of your journey in life. “The Flower of Life” is based on sacred geometry and is a symbol first found at the Osirion temple in Egypt. “Guidance” expresses the story of Theseus and the Minotaur. “Life” features a labyrinth found on a Hopi reservation in Arizona. 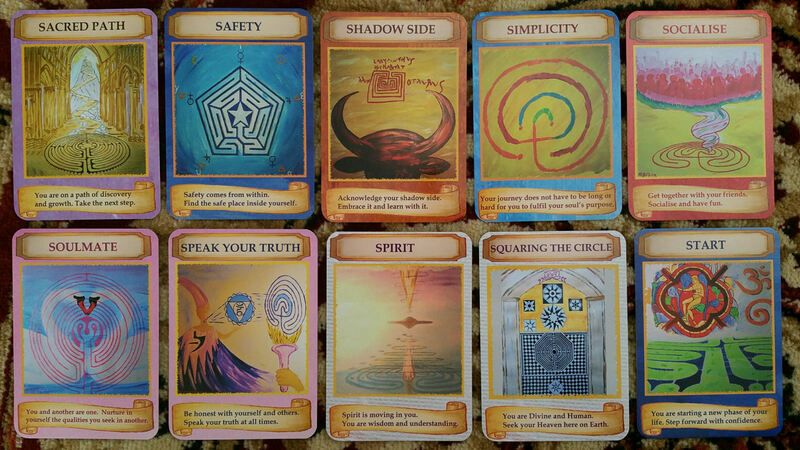 The Labyrinth Wisdom Cards seem to invoke Melchizedek traditions. Melchizedek was the King of Salem and a priest and to get a sense of his mystical importance, the New Testament of the Bible refers to Christ as “a priest forever in the order of Melchizedek.” He was a magi of immeasurable power In the gnostic traditions, Melchizedek is a divine savior and one who can purify you of your sins. He was also an “intercessor and advocate of the heavenly angels.” An ancient theological text, Little Labyrinth, makes mention of Melchizedek and his divine essence and mystic methodologies for receiving visitations from The Holy Ghost. 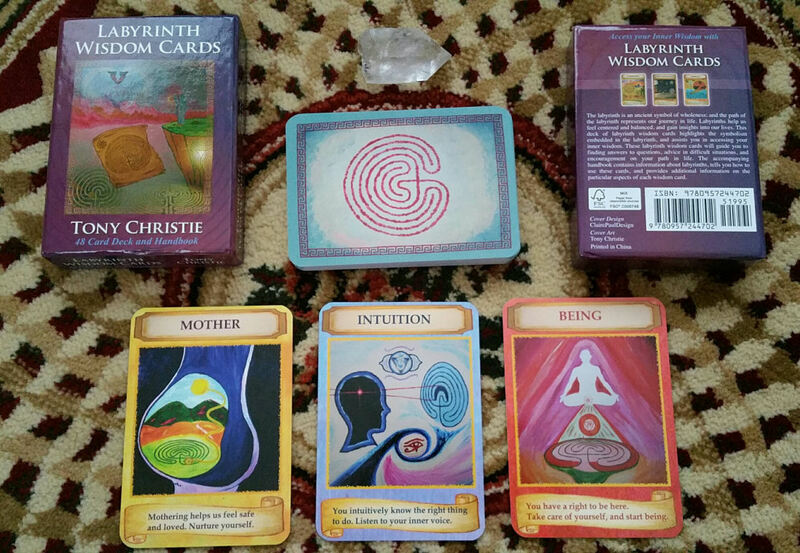 Christie synthesizes Melchizedek traditions with his concept of the labyrinth to inspire the conception of the Labyrinth Wisdom Oracle Cards. Sidebar Note: Two books may be of interest here. The Melchizedek Tradition: A Critical Examination of the Sources to the Fifth Century A.D. and in the Epistle to the Hebrews by Fred L. Horton, Jr. (Cambridge University Press, 2005) and New Perspectives on 2 Enoch: No Longer Slavonic Only by Andrei Orlov and Gabriele Boccaccini (2012). The accompanying guidebook notes that the art on the deck are sourced from Christie himself. The paintings pull in symbolism from many cultures, East and West. There is the Ba Gua transformed into labyrinths weighing yin and yang on a cosmic scale, in the card “Balance.” The card “Money” has the Chinese character for prosperity. We see scarabs and a golden phoenix rising from flames on the card “Death and Rebirth.” A totem pole is featured on “Animals.” Ascetic monks from what appears to be Eastern religious traditions are featured on “Guidance.” I really love the art on these cards. I felt very drawn to the “Moon Goddess” card for some reason. The card is inspired by Luna, the Roman goddess of the moon. In the bottom left corner you see a 9×9 magic square for a total of 81 squares, corresponding with the mass of the earth in ratio to the mass of the moon (81x). Also, the speed of the moon’s travel around the earth is 81x faster than the speed of the earth’s travel around the sun. The 9×9 magic square here is referred to as Luna’s Labyrinth. “Safety” features a pentagram and a pentagonal labyrinth with five points for the four elements and the fifth, spirit, represented by five planets– Mercury, Venus, Mars, Saturn, and Jupiter. The letters along the outer edges spell ut hygiea, for health, happiness, and wholeness. The “Shadow Side” card features the labyrinth of the Minotaur. For me, the card was also reminiscent of The Devil from the Major Arcana of tarot. Many of the cards feature sacred sites, like “Square Circling the Circle” is inspired by symbolism found at the Basilica of Saint Quentin in France or “Start,” from the stained glass windows at Chartres cathedral. Speaking of tarot, the cloaked figure in the right top corner of “The Long Road” is The Hermit from Key IX. “The Source” reminds me of The Sun card and something about “Transition” calls to mind the Death card. I’ve enjoyed working with these cards in the professional setting, often drawing from them toward the end of a divinatory session. In my experience, the card drawn for a question is always apt and this oracle deck is exceptionally versatile. 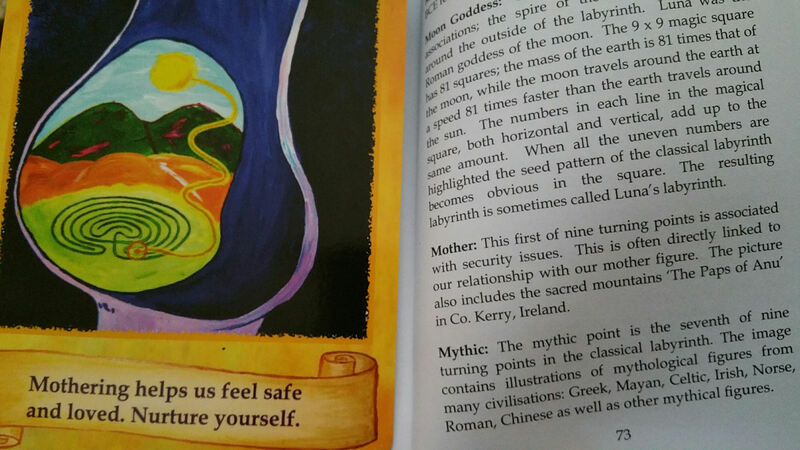 The deck comes with an 81-page perfect-bound guidebook, the Labyrinth Wisdom Cards Handbook, which is just fantastic. I’m not knowledgeable when it comes to labyrinth, so the Handbook was fantastic at initiating a newbie and providing a great deal of foundational reference material. 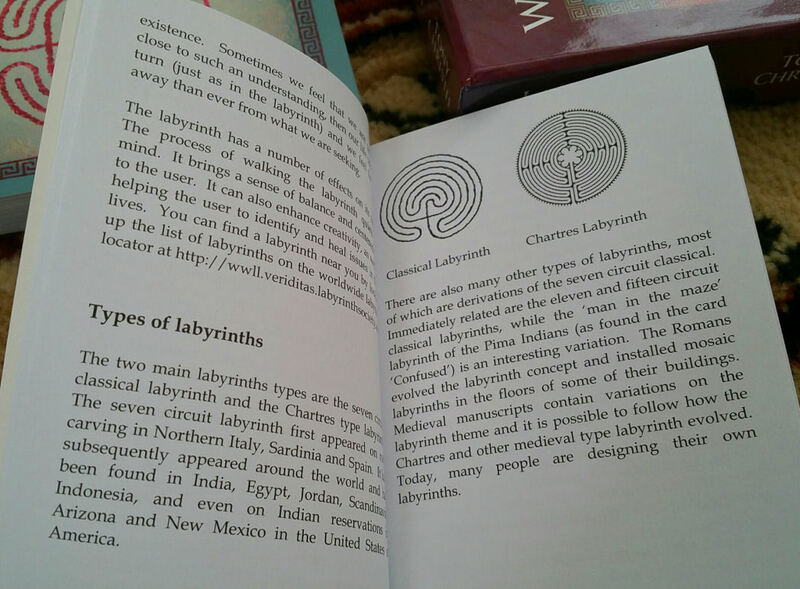 You learn about what labyrinths are, the different types of labyrinths, the cultural context of labyrinths in Europe, Asia, India, and North America, and associations of the labyrinth symbolism with the seven chakras, DNA, the Nazkca lines in Peru, and European mythology. 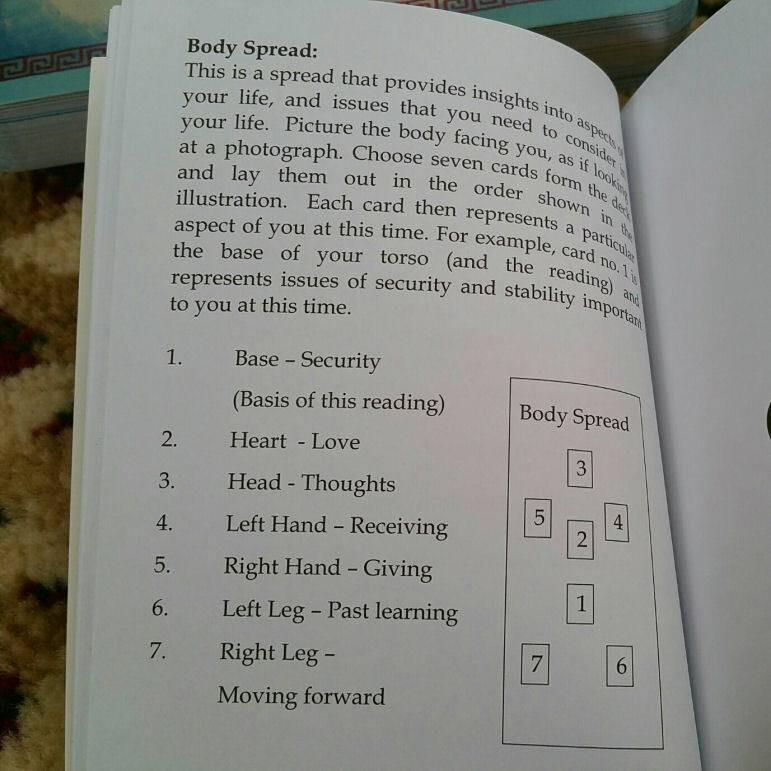 Spreads are taught and then each of the 48 cards is given a one page entry. The Additional Notes section at the very back of the Handbook was of most interest to me, where Christie explains his inspiration and sources behind the cards. Now let’s take the cards for a test run. You recall the inquiry you held in your mind through this deck review and the spread of three cards I showed earlier in the post. Below, look at those three cards again, bringing that question you had from the back of your mind to the forefront. Present the question to the cards and choose one from below– left, center, or right. Let’s delve deeper into each card, drawing upon the Handbook for guidance. 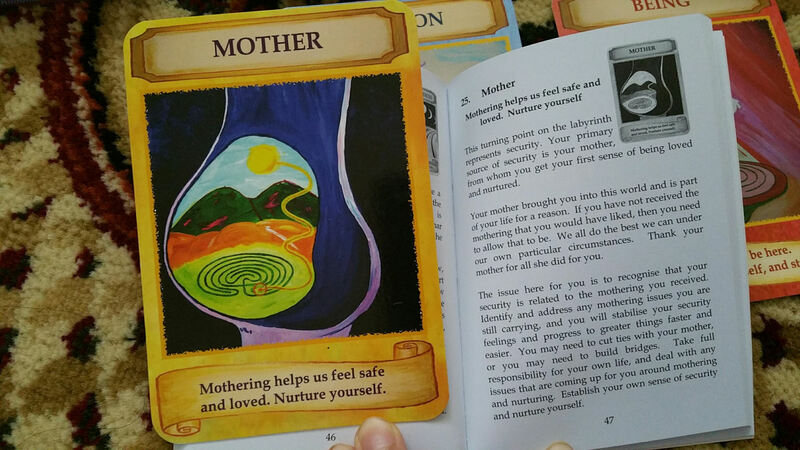 The “Mother” card illustrates the first of nine turning points associated with security issues, per the Handbook, and represents the direct relationship between you and your mother figure. The imagery of the card is inspired by the sacred mountains “The Paps of Anu” in Co. Kerry, Ireland. This card asks that you reflect on your relationship with your mother figure and also on the woman who brought you into this world and gave you life. Have you received the mothering that you need for a healthy life? Your issues with security are related directly to the mothering (or lack thereof) you received. This card asks that you take full responsibility for your life by dealing with issues around mothering and nurturing. 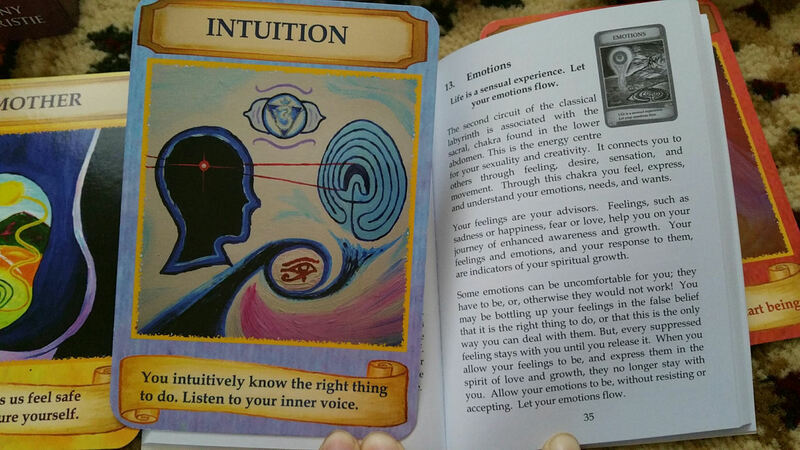 The card “Intuition” reminds you that you are born intuitive and urges you to exercise your intuitive abilities. When you’ve gotten into the habit of ignoring that voice of intuition in you, then you arrive at a place of confusion and loss, thinking that you don’t know the answer. But you have the answer in you and it’s being told to you by that inner voice. Remember how to listen to that voice and you’ll know the answer to your question. This card is associated with the sixth circuit of a classical labyrinth, which Christie corresponds with the third eye chakra. To help strengthen your awareness of your third eye chakra, spend time with other intuitives, wear the color indigo, or work with a piece of lapis lazuli. If you chose the right-most card, then your message is “Being.” This card is located with your root chakra and represents the element Earth. This is about you needing to be more grounded, to feel more grounded. A long journey is ahead of you for learning to deal with security issues, relating to money, safety, or your sense of home. Now is the time to strengthen your root chakra and instill greater balance and grounding in your life, learning how to eliminate personal fears. 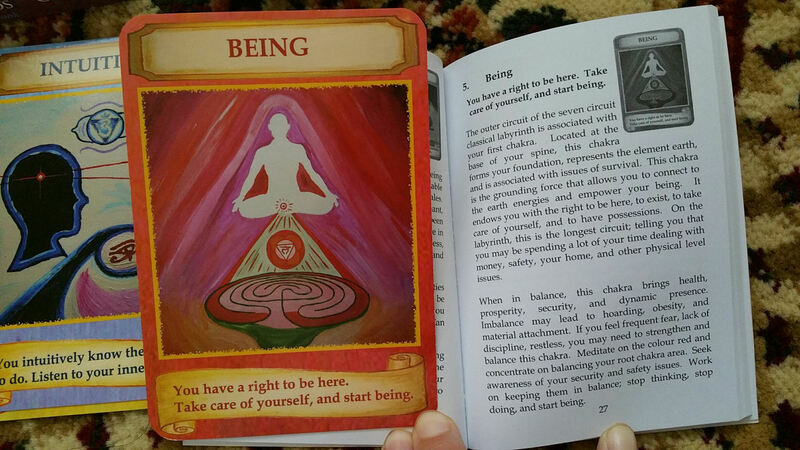 The Handbook recommends meditating on the color red and concentrating energy to your root chakra. “Stop thinking, stop doing, and start being,” counsels the card. 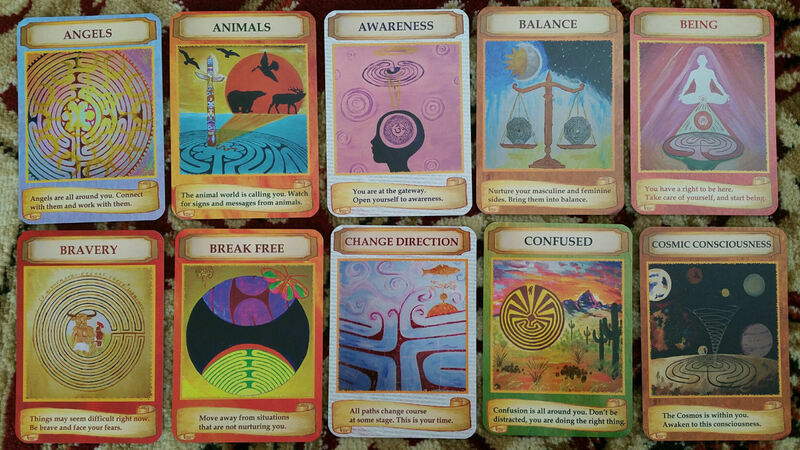 The Labyrinth Wisdom Oracle Cards by Tony Christie is an indispensable deck to have in your arsenal of tools as a mystic. 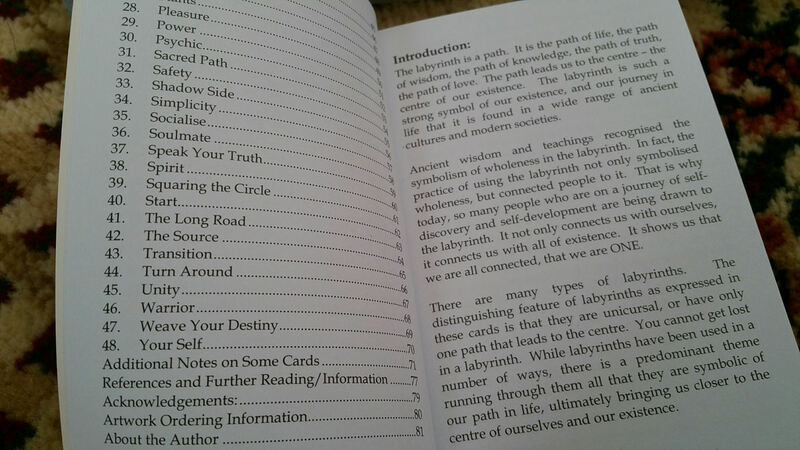 Labyrinth Wisdom is a self-published deck that you can buy direct from Christie through his website. 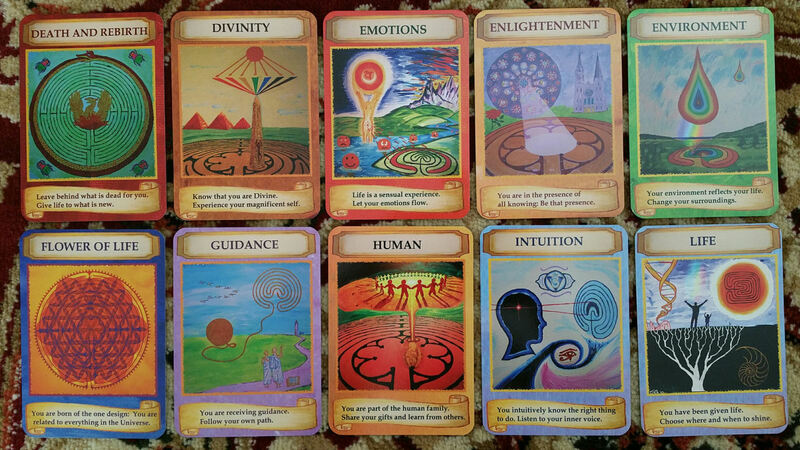 I’m drawn to the simplicity and rich symbolism of the art and love the messages that seem to apply aptly to whatever question I have asked of the cards. One of my favorite oracle decks purchased this year. Yes, I’m thinking the same Nancy. Beautiful, intriguing deck. I’m very drawn to it! Thanks!